Of the titles I included in a mega-book review about Internet optimists and pessimists that I posted here a few months ago, I mentioned Lee Siegel’s new book, Against the Machine: Being Human in the Age of the Electronic Mob. It is certainly the dourest of the recent books that have adopted a pessimistic view of the impact the Internet is having on our culture, society, and economy. Because Siegel’s book is one of the most important technology policy books of 2008, however, I decided to give it a closer look here. As I noted in my earlier “Net optimists vs. pessimists” essay, after reading Cult of the Amateur, I didn’t think anyone else could ever be quite as over-the-top and Chicken Little-ish as Keen. 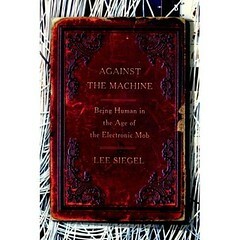 But after working my way through Siegel’s Against the Machine, I realized I was wrong. It made Keen seem downright reasonable and cheery by comparison! Keen and Siegel seem to be in heated competition for the title “High Prophet of Internet Doom,” but Siegel is currently a nose ahead in that race. The Net is destroying (or at least greatly diminishing) the role of experts, authority, “truth”, and traditional societal norms and institutions. This is having (or eventually will result in) dangerous ramifications for our culture, economy, and democracy. The personalization and customization that the Information Age and the Internet have spawned is an unambiguously negative development for our society and culture. Moreover, in large part, the entire Web 2.0 experience is largely just about commercial interests furthering their ends. Let’s take a closer look what Siegel says about each. Like many other Net skeptics, Siegel views Wikipedia, YouTube, blogs, and almost all user-generated content with a combination of confusion or contempt. “[S]elf-expression is not the same thing as imagination” or art, he argues. (p. 52) Instead, he regards the explosion of online expression as the “narcissistic” bloviation of the masses and argues it is destroying true culture and knowledge. “Under the influence of the Internet,” he says, “knowledge is withering away into information.” (p. 152) Our new age of information abundance is not worth celebrating, he says, because “information is powerlessness.” (p. 148). One reason Siegel gets nostalgic about the age of scarcity is because elites like him — and others who were lucky enough to have access to mainstream media — had a more privileged place in the old media world. As a social / cultural critic, he can’t be happy with all the competition he now faces in that field from the blogosphere and online media outlets. But it’s difficult to sympathize with Siegel’s position that others should be excluded from having a voice now in an effort to preserve the old order. After all, for the past seven decades, public policy has largely been preoccupied with getting society out of the scarcity mess (even though public policy created much of that mess!) by ensuring that citizens had more choices and outlets. Now that we have more options, some people like Keen and Siegel aren’t happy about the fact that the hoi polloi have been empowered. But, even if some traditional institutions lose the dominant position they once held in society, plenty of “authoritative” and “professional” media options and outlets continue to exist. Our new Information Age simply empowers millions of other voices to join the conversation and offer alternative perspectives and input. It’s difficult for me to imagine anything more insultingly stupid than those last two statements. The insulting part about them is that Siegel is essentially telling us all to shut up! We all need to put down our pens — or, rather, our keyboards — and understand that we are doing great harm to those journalists, institutions, or other enlightened few who are really providing the “critical, scrutinizing” function so essential for a healthy democracy and culture. It’s just blatantly elitist for Siegel to suggest that only a select few have any business sharing their views with the world, and he even acknowledges that several times in the book. But he wears that elitist tag like a badge of honor as he stares down his nose at the newly empowered masses, snorting in disgust at everything he sees. And the stupid part about those statements above is that the vast majority of bloggers or online participants are absolutely not in it for the money, or even out to take down mainstream media. They just want to be heard. But, again, Siegel believes that what you all have to say is not worth hearing anyway. In this regard, Siegel is channeling another Net skeptic, the prolific Cass Sunstein of the University of Chicago Law School. In his 2001 book Republic.com, Sunstein also referred to Negroponte’s “Daily Me” in contemptuous terms, saying that the hyper-customization of websites and online technologies was causing extreme social fragmentation, isolation, and alienation, and could lead to political extremism. “A system of limitless individual choices, with respect to communications, is not necessarily in the interest of citizenship and self-government,” he wrote. As I said in my review of his book in Regulation magazine that year, Sunstein was essentially saying that the Internet is breeding a dangerous new creature: Anti-Democratic Man. “Group polarization is unquestionably occurring on the Internet,” he proclaimed, and it is weakening what he called the “social glue” that binds society together and provides citizens with a common “group identity.” If that continues unabated, Sunstein argued, the potential result could be nothing short of the death of deliberative democracy and the breakdown of the American system of government. The reality is that citizens do face an overwhelming number of media choices today, and that probably does make it somewhat more difficult for them to have “shared experiences” involving any individual news or entertainment program. But that isn’t really such a lamentable development. Government need not take steps to make sure everyone watches or listens to the same programs each night so they can all talk about them around the watercooler at work the next day. It’s just as good that everyone can discuss something different that they saw or heard the night before. And the very fact there are so many distinct media options available to citizens is better for a healthy democracy than a limited range of media options. Again, regardless of who owns what, the fact remains that we have more sources of news, communications, and entertainment than ever before in this country. What Keen doesn’t seem willing to tolerate is that when everyone has a voice, a lot more silly things are going to be said and heard. Back in the days before we all had our own soapboxes (websites, blogs, social networks, YouTube posts, etc.) we all had opinions, but we had few ways to get those opinions out. Now that the Internet has become the great leveler and given everyone the ability to be a one-person newspaper or broadcaster to the world, the dream of a more fully empowered citizenry is slowly becoming a reality. The upside is that everyone gets an equal chance to be heard. But the downside is that everyone gets an equal chance to be heard! That is, with the good comes some bad. There are wonderful contributions to culture and human communications being made by average Joes and Janes across the globe because of the Web. But let’s face it, there’s a lot of crap out there too. Cutting through the cultural clutter can been a real challenge, and even with the best search tools in the world at your disposal, it can still be difficult to find that diamond in the rough. But aren’t we better off as a society because of the opportunities now at our disposal? Isn’t an age of media and cultural abundance — warts and all — still preferable to the age of scarcity which preceded it?